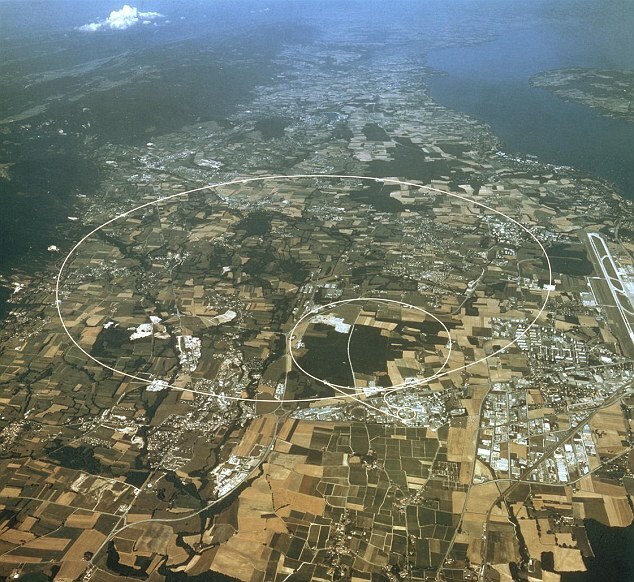 Aerial view drawn to show the underground path of the Large Hadron Collider beneath the French-Swiss border. Image Source: Daily Mail. The problems of Dark Matter and of cheap limitless energy may be answered here, and initiate unprecedented global growth. 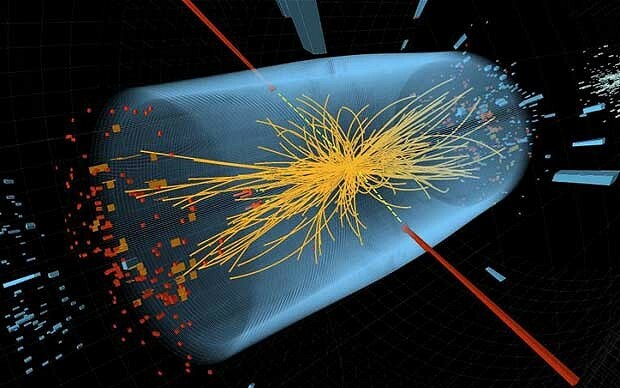 The God Particle brings humankind to the onset of a new age, and allows us to glimpse a broader reality in which our modes of life, philosophy and spirituality will be revolutionized. 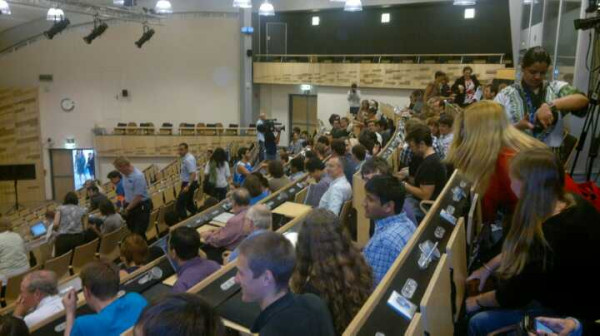 CERN news conference auditorium just before the announcement was broadcast (4 July 2012). Image Source: Alejandro Gomez. 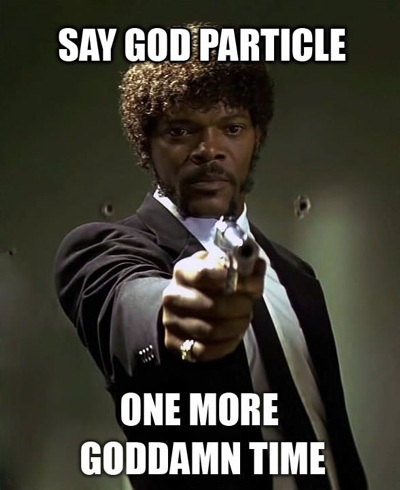 The particle's popular nickname may be portentous. 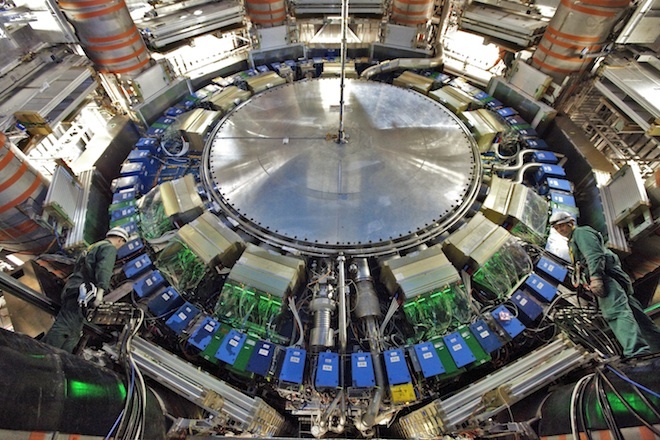 The Higgs particle could confirm physicists' wildest theories. Radical Shift warns that huge scientific discoveries are easily mobilized in the name of completely unrelated ideas and situations; that blogger points to the troubling correlation between incredible 2003 sequencing of the human genome and the misapplication of consequent attitudes to financial practices. Understanding how and why scientific discoveries are taken out of their confined fields and are mobilized in other contexts - sometimes with dangerous economic or damaging political or social effects - is the province of the humanities, not the sciences. At precisely the point at which they seem furthest from each other, science and religion may converge, giving birth to completely new world faiths. Will people worship fanciful versions of scientific discoveries, or replace economists and politicians with scientific oligarchs? Will advanced science become mythology? Something like this happened to Darwin's Theory of Evolution when it fell in the hands of Social Darwinists. The possibility that a great expansion of a secular high tech civilization could ultimately give rise to new gods is as fascinating as it is unsettling. However, scientific and technological advances do inspire explosions in culture, as is evident with the birth of the World Wide Web. Today's press conference revealed this contrast between two paths and two worlds. The highly technical and scientific announcement was followed minute by minute online by millions of people who could not understand it. Nonetheless, they knew it was important; they knew that history had been made - and that history had suddenly changed. Michio Kaku on the importance of the God particle. Video Source: Youtube (Hat tip: Spaceports). 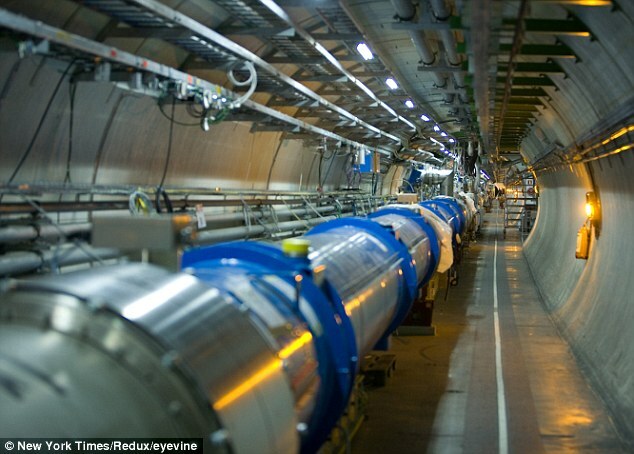 See all my posts on the Large Hadron Collider. See all my posts on Dark Matter. Click to see my posts on Quantum Physics.